Thurston is a large and busy village just off of the A14 not far from the edge of Bury St Edmunds, with the blessing of its own railway station on the Ipswich to Cambridge line. The church sits on the edge of the village, a large, crisp building that stands upright above the road to Pakenham. None of the rough-and-readiness of many of Suffolk's rural churches here, for what you see from the road is entirely of the 19th Century. On this site, we have often come across the work of the unfashionable Victorian Suffolk architect Edward Hakewill, son of the more famous Henry Hakewill. He had worked extensively in Suffolk the 1860s, and is sometimes good, at Kenton, for instance. 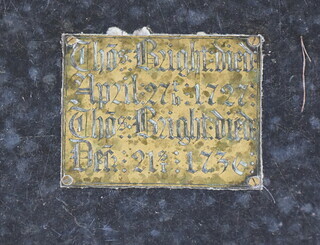 But he can also be very undistinguished, as at Rushmere, Brantham and Shottisham. The reason I was intrigued by Thurston is that it was the work of his lesser-known younger brother, John Henry Hakewill, and I was interested to see what he had got up to. 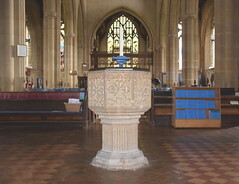 His brother Edward's usual approach was to go in, build a north aisle, reduce the internal furnishings to a polite middle-brow sacramentalism, and then leave. John Hakewill had rather more than that to do here, because of something that happened on the night of Sunday March 18th 1860. 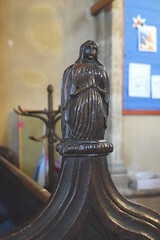 In common with most Suffolk churches, St Peter had been greatly neglected through the 18th and early 19th Centuries, and its need for a facelift had become obvious. In fact, John Hakewill had already been engaged as the architect for a thorough going-over of the old structure. But shortly before midnight, supposedly on the night before work was due to commence, the tower fell. It is hard to imagine the effect of an incident like that on a tiny, remote, rural community. The one permanent, ageless structure in its midst suddenly disappeared overnight. The tower collapsed straight down, but falling rubble took out the nave and aisle roofs, as well as destroying piers of both arcades. 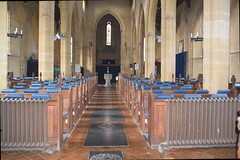 The parishioners decided to do the obvious, and retreat into the chancel for services. However, just ten days later, the rest of the nave collapsed, bringing down what remained of the arcades and roofs, and destroying all the furnishings, including the pulpit and lectern. And so, a decision was made to rebuild from scratch, accommodating the new church to the surviving chancel and porch. 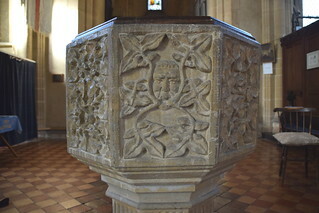 As Roy Tricker points out, Hakewill was very much of the prevailing opinion of the time that Decorated was the only suitable style for a medieval church (despite the fact that Suffolk's finest moments are mostly Perpendicular), and, as a Bury Post article of the time noted, Hakewill was determined that the new church should be entirely in Decorated and correct architecture, replacing the inferior architecture in the old structure. And so, there it is today. The exterior is certainly impressive, and the church reopened barely 18 months later, at the cost of about £3,500, about three quarters of a million in today's money, an extraordinary bargain I would have thought. This must have been a huge church, even before Hakewill's rebuild - I wondered if it had been a match for Rougham, across the A14. 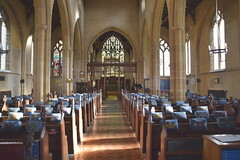 Much of the chancel appears relatively original, despite considerable patching up. The imposing tower itself is beginning to mellow with age, although perhaps it still bears a disconcerting similarity to what might be the tower of a Typically English Village Church in a model village, thanks to Hakewill's insistence on 'correct' Dec. 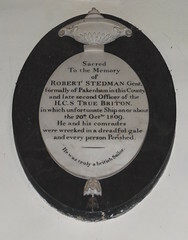 But when you consider what Richard Phipson did across the road at Finborough and Woolpit during the same decade, St Peter may have got off lightly. You step into a large, tidy space full of light - no gloomy north aise here. Inevitably, there is an urban feel to the wholly 19th Century interior, although there are some earlier survivals. 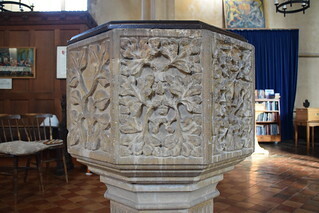 One of these is the font, a fine perpendicular piece whose foliage panels conceal a green man or two. Can it have come from here originally? It is hard to see how the font could have survived the collapse of the tower. 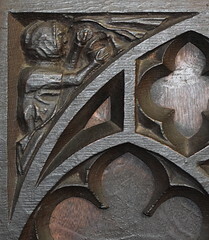 There are a couple more medieval benches now placed at the west end of the south aisle, also with green men on them. Bringing us right up to date is one of Suffolk's several sets of royal arms to Queen Elizabeth II (there are others not far off at Rattlesden and Lavenham, among others). This set is dated 1977, the year of the Silver Jubilee. 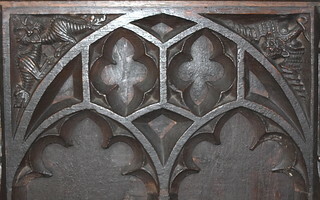 The woodwork in the nave is of a decent quality, presumably installed as part of the same commission as the rebuilding, but the reredos in the chancel is rather finer, the work of Father Ernest Geldart, the Anglo-catholic carpenter-priest whose parish and studio were at Little Braxted in Essex. Its commission may give us some idea of the churchmanship here at Thurston in the early years of the 20th Century. 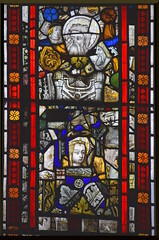 Collected fragments of 15th Century glass include a number of striking heads, as well as parts of the figures of a cherubim, a pope and a bishop. Up in the chancel there is what appears to be a pair of delicious medieval angels holding scrolls, although they are, I think, 19th Century fakes. 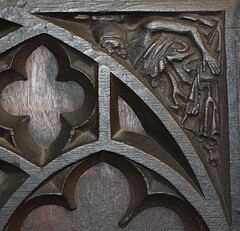 Certainly 15th Century are the stalls below, however, which survived the fall of the tower and have delightful little figures in the spandrels. In one, a woman mixes up medicine in a bowl while across from her a man lies sick in bed. 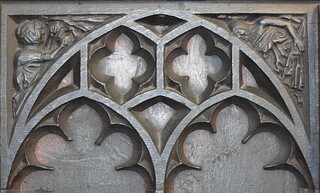 In other spandrels are dragon and lions. 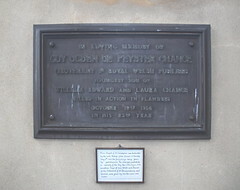 A name that many will associate with Bury St Edmunds is that of the Greene King brewery, and the Greene family are commemorated here at Thurston. 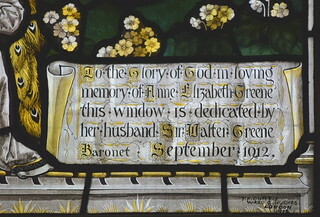 Sir Walter Greene paid for the restoration of the chancel. 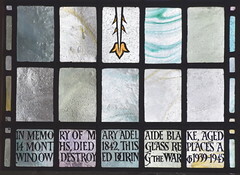 The memorial windows to the Greene family are by the stained glass firm Ward & Hughes, and were installed over thirty years from 1890 to 1920. Ward & Hughes were a company that went through three distinct phases. 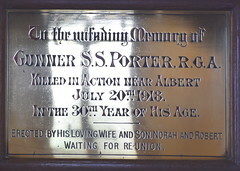 In their early years they were often quite interesting, as across the border at Pentney in Norfolk, for example. 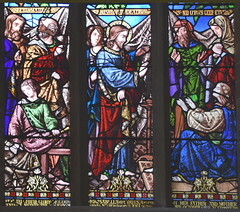 Later in the 19th Century they became one of the largest mass-producing workshops in the country, churning out thousands of windows for hundreds of churches all over the world that are largely of a similar middle-brow quality. In the 20th Century, however, the wheels came off a bit, and the windows vary greatly. There is a feeling that patrons were given too much say in the design, which is always a mistake, and sometimes they can be pretty awful. But here at Thurston the glass is spectacular. The 1890 glass is certainly not run-of-the-mill, being a version in glass of Axel Ender's painting Easter Morning. 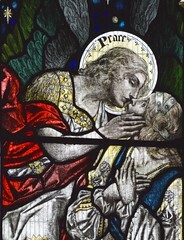 Whether it is good or not is perhaps a matter of taste, but the other two windows are rather thrilling, and delightfully mawkish - witness the figure of Peace stooping to kiss the lips of Righteousness. 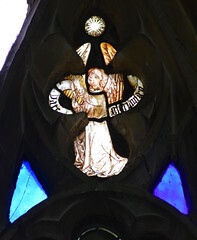 There is a Ward & Hughes window in a similar style to these last two up the road at Pakenham. 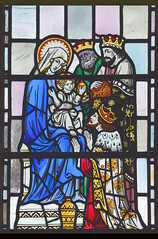 Elsewhere in the church, the lovely 1950 window of the Adoration of the Magi at the east end of the south aisle is by E L Armitage for Powell & Sons, and it replaced damaged glass which commemorated a 14 months old child, Mary Adelaide Blake, who died in 1842. 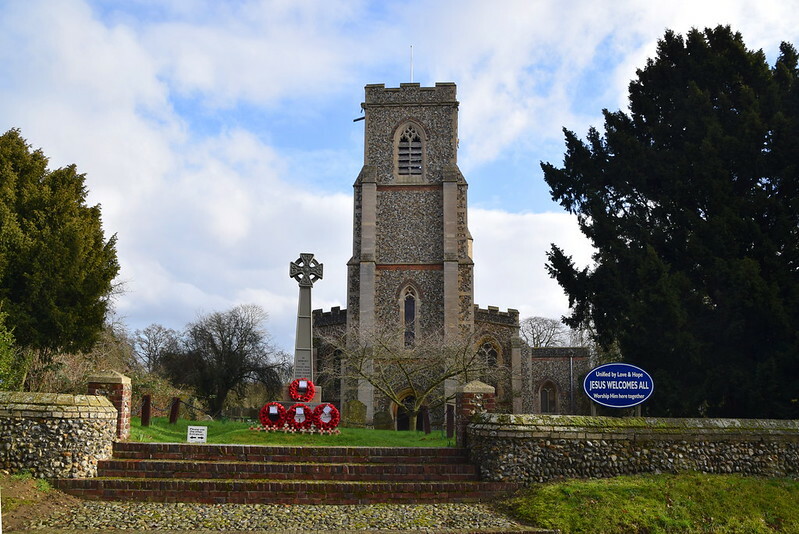 The date of the new window suggests that the old one suffered blast damge in the Second World War, a common fate for these Suffolk churches surrounded by American air bases. 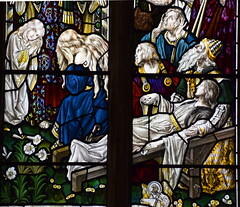 The best window in the church, however, is at the east end of the north aisle, and depicts the Raising of Jairus's Daughter in a quiet, painterly style. It remembers Isabella Blake, who died in 1856, and nobody seems to know who it is by. 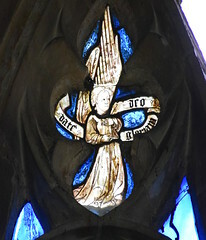 Intriguingly, given that this is also to a daughter of the Blake family, it seems possible that the lost window in the south aisle was by the same workshop. For many years, Thurston church was difficult of access, so it is pleasing to discover that it is now open to strangers and pilgrims every day. Even more, the sign in the porch asks you to be careful not to accidentally lock the door on your way out.